Computed Tomography (CT) has its origins in medical applications with the first commercially viable scanner dating as far back as 1972. Since then the technology has undergone considerable development to evolve into the equipment now used by both the medical and security sectors. We asked radiology specialist, Prof. Dr. Marc Kachelriess from the German Cancer Research Center to share his expert views on the capabilities of today’s CT scanners. Q: What type of CT scanners does the medical profession use today? A: Almost exclusively rotating, third generation CT scanners. There have been static CT scanners, like the electron beam CT, but they were not very successful, proving too expensive to manufacture. CT was invented for medical applications and we have seen it progress through various stages to reach the point where rotating scanners have literally no mechanical issues and offer high availability, consistent data and excellent image quality. Q: How reliable is the rotating gantry? A: Today’s rotating CTs have no issues from centrifugal forces and have very good rotary bearings with an excellent lifespan. I am not aware of any technical problems and find them very reliable – even when in use around the clock. Q: What are the benefits of rotating CTs vs static? A: Rotating CT does offer quite a few benefits. For example, the image quality is excellent. In the medical world we need a spatial resolution four times higher than used in security applications. We need to see a lot more detail. Rotating CTs use an anti-scatter grid that reduces the amount of scatter reaching the detector and thereby avoiding a degradation in image quality. Static CT systems cannot use such an anti-scatter grid. To avoid excessive amounts of scatter such systems need to have a small longitudinal collimation which means far less detector rows than rotating systems. Depending on the design of a static CT the number of projection angles may be lower than optimal. This may impair image quality. Read more about our ECAC Std. 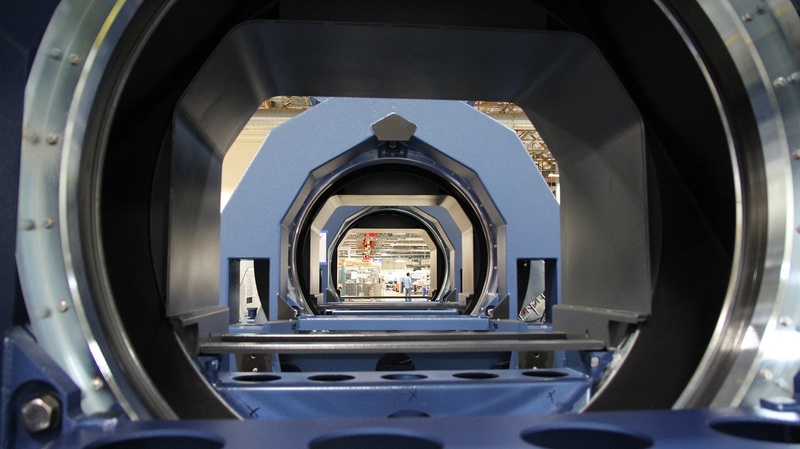 3.1 approved HBS scanners using rotating CT gantries: HI-SCAN 10080 XCT and CTX 9800. Professor of X-Ray Imaging and Computed Tomography at the German Cancer Research Center (DKFZ) in Heidelberg, Germany. Prof. Dr. Marc Kachelriess has been researching and working with many different aspects of X-ray computed tomography since the mid-1990s. He is not only active in medical imaging where clinical CT scanners, cone-bean systems for radiation therapy and C-arm CT scanners dominate; but also in the fields of luggage screening, non-destructive testing, electron beam CT, industrial CT, CT metrology and dimensional CT. A prolific and well published author, Prof. Dr. Marc Kachelriess also organises several conferences and workshops on tomographic and high performance computational imaging. Before his appointment in 2014 as Professor of X-Ray Imaging and Computed Tomography at the German Cancer Research Center, Prof. Dr. Marc Kachelriess was Professor of Medical Imaging at Friedrich Alexander University. Since 2009 he has also held an Adjunct Associate Professor position at the Department of Radiology at the University of Utah, USA. He lectures in medical imaging technology, physics and algorithms.